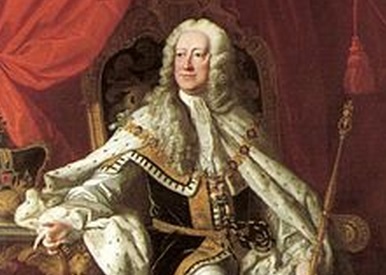 George Augustus was King of Great Britain & Ireland, Duke of Brunswick-Lüneburg (Hanover) and Prince-elector of the Holy Roman Empire from 11th June 1727 until his death on 25th October 1760. He was crowned shortly after the controversy (in Ireland) of Wood’s coinage. Great Britain, Hanover and Prussia and their allies Hesse-Kassel and Brunswick-Wolfenbüttel were pitted against other European powers, including France, Austria, Russia, Sweden and Saxony. The war involved multiple theatres from Europe to North America and India, where British dominance increased with the victories of Robert Clive over French forces and their allies at the Battles of Arcot and Plassey. In the annus mirabilis of 1759, British forces captured Quebec and Guadeloupe. Many towns prospered; the cattle-market was an important source of prosperity. Textiles and agricultural exports mainly went to England. Linen became a huge domestic industry, dominated by Protestants. Cotton villages began to appear. Colonial restrictions caused few problems. Trading networks expanded as transport improved. Meanwhile, to ‘grease the cogs’ of commerce a new ‘regal’ coinage was introduced in the 1730’s following the failed recent experiment of Wood’s Hibernia coinage of the 1720’s. At last, everyone agreed, that Ireland’s commercial future was assured. It did, however, address the appalling amount of sub-standard un-official, private token coinages that then flooded the Irish marketplace but were not acceptable as payments outside of Ireland. The Wood’s coinage (patent tokens) were circulating quite freely at this time, along with all of their predecessors, so the arrival of the new ‘regal’ halfpennies and farthings had an immediate effect in terms of clearing out the old tokens (incl. the Wood’s ‘patent’ halfpennies). “the coinage of the fine copper halfpence by George the Second, in 1736 and 1737, and of farthings in 1737, put an end to the issue of private tokens… They were withdrawn from circulation, and full value given for them in gold or silver” … which accounts for the extreme rarity of some pre-1730’s Irish trade tokens. Could the Wood’s coinage have been exported to the America’s in this way ? – in small quantities by emigrants, or in larger quantities via Irish and Scottish traders, operating out of ports served by emigrant ships, i.e. the emigrant ship captains could have made a tidy profit by transporting small casks of coins on every crossing. ??? 1737 George II, Type I farthing S-6608 D&F-558 George II, the superb left-facing Irish portrait, bare head with ribbon-ties behind. Plain edge. Note: The 1738 (Type I) is one of the scarcest regular issue Irish farthings. These coins are (now) not as common as the preceeding Wood’s coinage in terms of availability to collectors and, with the exception of the 1760 issue, they are difficult to obtain in much better than Very Fine condition. This would imply that they should be more expensive than Wood’s coinage but, since they were never ‘officially sanctioned’ for use in the American colony, they are not as widely collected and their value is low when compared with Wood’s coinage. Where there was no varied local economy, small farmers and cottiers became dependent on pigs and potatoes. They disrupted the establishment view – both here in Ireland and in England. They broke the stranglehold of subservience to the established churches and liberated men to think (and act) independently of scripture. Contrary to the view of ‘trickle down’ economics, Dublin’s great economic progression in the 18th C was due to small, self-employed businessmen, manufacturers and traders. It had nothing to do with the ‘undertakers’ who, since the Cromwellian invasion grew wealthy by neoptism, corruption and restrictive legislation. A healthy, self-sustaining middle class has its roots amongst the working classes. In the mid-1740’s the Royal Mint saw fit to produce a farthing dated 1744. No other Irish Type II farthings are known to exist for George II. 1744 Farthing of 10 Strings, S.6609, 4.36 g., coin orientation, plain edge. Laureate bust left of the young George II left, legend around GEORGIUS . II . R E X ., with the pellets at middle height. Top ribbon to middle of X. Rev. crowned harp of 10 strings divides date at bottom 17 44, with well spaced H I B E R N I A . around at top, with B well to left of crown. Good Very Fine with a trace of verdigris on the obverse. Very well detailed laureate head. Note: The 1744 (Type II) is one of the two scarcest regular issue Irish farthings. In 1747, the name GEORGIUS was changed slightly to GEORGIVS (with a Roman V) – thus a third type became available to modern day collectors. 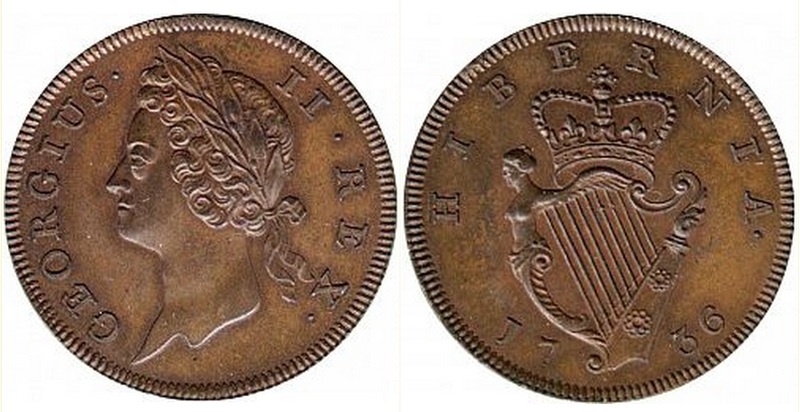 No Irish Type III farthings are known to exist for George II..
A 1747 George II, Type III copper Halfpenny of 9 Strings, S.6607, 8.52 g., coin orientation, plain edge. Laureate bust left of the young George II left, legend around GEORGIVS . II . R E X ., with the pellets at mixed heights. Top ribbon to just rt. of middle of X; ribbon well clear of X. Rev. crowned harp of 9 strings divides date at bottom 17 47, with H I B E R N I A . around at top. Top of crown to midpoint between E and R.
Note: Many catalogues (and dealers’ price lists) appear to include ‘1755’ as a legitimate date. Recent research by John Rainey and Graham Dyer suggest that this date was not officially produced and that all of the specimens of this date (and listed in major public collections) are ‘contemprorary’ counterfeits. Their culture included the literature of Swift, Sheridan, Burke and others. By the time of George II’s death in October 1760, the Age of Enlightenment was leading towards the American Revolution, the French Revolution and the beginning of the end of the monarchy’s divine right to rule throughout Europe. And, just before his death, there was a final (Type 4) issue of coins in the name of George II. The Royal Mint in London was hard-pressed to produce enough coin for England, Scotland and Wales during the reign of George II, so we do not know how many were produced for each year for Ireland. In general, the Irish coinage of George II is very scarce in the higher grades but Type IV (1760) seems to be ‘easier to get’ than many of the other dates and types.